This is a 10-inch subwoofer that can deliver satisfying bass, especially when you mount it in smaller cars. Its compact profile also makes it easy to install in door panels. This shallow mount subwoofer has a mounting depth of just 3.5 inches. It can handle up to 200 watts RMS. This subwoofer is ideally paired with a mono amplifier with 150 to 300 watts RMS. According to most reviews, this is one of the more affordable 10-inch subwoofers today. Despite the affordable price, it has the decent bass output that should satisfy most drivers except for the audiophiles. This subwoofer has a strong cone made by mica-injected polypropylene cone. The said cone is not just strong but also durable. It can retain its shape even during long playing sessions. This makes the subwoofer very reliable. The said cone is also complemented by a high-density polyfoam surround that results to the subwoofer producing fat and deep notes. Owners of this subwoofer can wire this sub for 1- or 4-ohm impedance, giving them a lot of flexibility in setting up their audio system. Moreover, it can also work in both ported and sealed enclosures. This gives owners the freedom to choose the type of bass produced in their vehicles. Traditionally used in-depth mounted models, spider venting is featured in this model. It keeps the motor cool during long playing sessions, so the chances of the sub blowing out are greatly reduced. This ultra shallow subwoofer won’t take up a lot of passenger or cargo space in your car. It measures just 6 x 12 x 10 inches, so this should fit well under or at the back of car seats. It can also be mounted on the trunk of the car. And with a weight of 15 pounds, moving this during installation should not be much of a concern. This subwoofer only has a 3.4-inch mounting depth, thus it can be placed under most car seats. It can even be used to replace the factory sub in the door panel. Q. What is the warranty for this sub? A. Rockford Fosgate backs it up with a one year warranty. Q. What’s the best enclosure for this sub? A. It should be in a sealed enclosure. 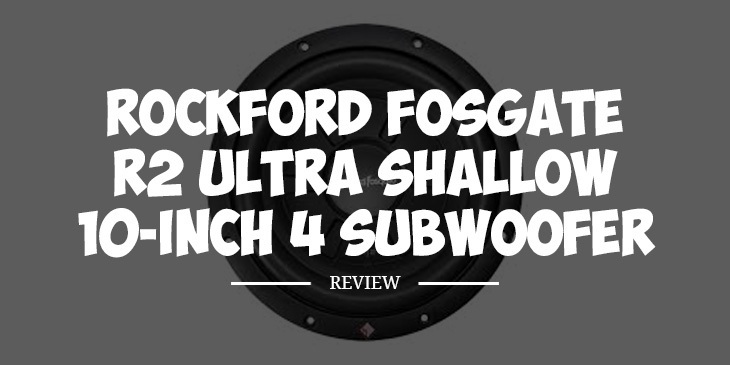 Rockford Fosgate is known for its affordable yet good quality subs, and this one is a fine example. Sure, this sub won’t blow you away. It won’t even disturb your neighbors when you have this in full blast. But your passengers will be able to hear and feel every low note coming from this subwoofer. It can provide clear and clean bass with minimal distortion. I also like that this has a very slim and compact design. Finding a place to mount this subwoofer should not be a concern at all, even if you are driving a compact car.These are the qualities that make this subwoofer highly rated on Amazon.com.